S is for sun. S is for star. We practiced writing an S in the air, printing an S and making them out of play doh. 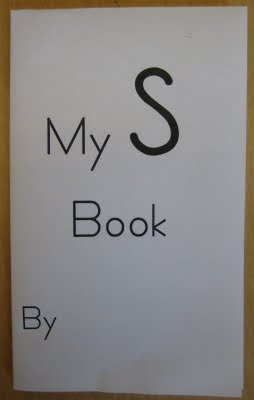 In our S books, we drew 3 things that started with the letter S and then printed the words. We did it as a group, so most words in this activity were copied. We will start "inventive spelling" (writing what you hear) in our journals soon (Most of the SKs and some JKs who are ready) (I scribe for the JKs and read them the words that they have dictated to me -- then they "read" it back to me while they point to the words). Some parents have asked about the order in which I teach the letters of the alphabet. We talk about many letters every day. 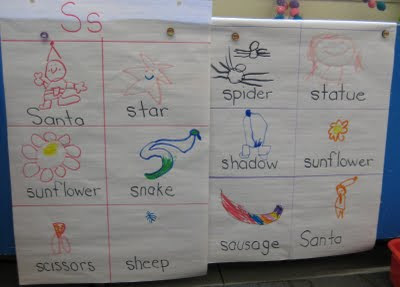 We talk about them in context when we are sounding out words or talking about words and letters in our messages and poems. In general we teach the most frequently used letters first. S, T, M, P, N. I taught A first because most children know A ( but it really is confusing because it makes more than 2 sounds!) But if we know A than we can write many rhyming words. I teach upper and lower case at the same time. While it is true that the upper case letters are easiest to print, there aren't many books written all in upper case. If we want our children to read, we have to teach them lower case too! 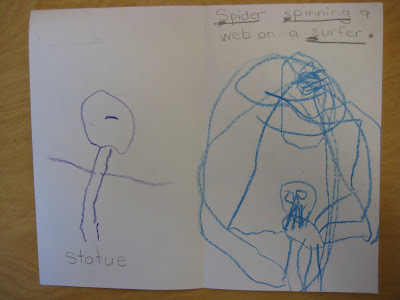 I know that a child REALLY knows his/her letters when they are copying something that I have written in lower case, and they write the whole thing in upper case! That means they have learned both, but are more comfortable printing in upper case. We often play matching games with upper and lower case letters. I teach letter names and sounds at the same times -- and we focus on the most common sound the letter makes (we focus on the hard C as in cat, for example). I do explain that sometimes the letter makes an extra sound. But when we are writing I expect the students to write the sound that they hear. 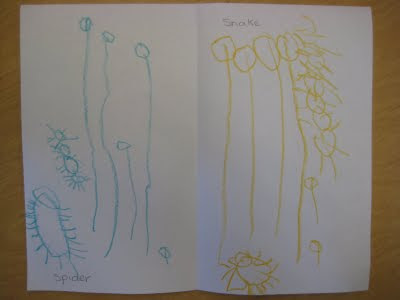 If they were writing circle, for example, I would expect them to write something like SRKL (vowels are difficult to hear)This is very acceptable and developmentally appropriate for kindergarten. If your child askes you how to spell somehting -- you should say "Try to write the sounds that you hear" When they ask "Is this right?" say something like, "yay! you wrote all of the sounds!". Then you are supporting them in their writing, but aren't fibbing to them. 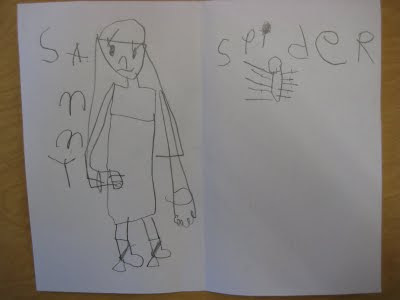 I often say to the children "In Kindergarten, we write what we hear, and we might hear things differently, but that's okay" We call this 'Brave Spelling'. I say "Be a brave speller and just have a try!" We also strettttch words out so we hear the sounds.